It is the dawn of a new year. The old king has just died childless, and the new succession must be decided before the end of this year. You are a local baron or countess with as good a claim as anyone else, so now is the time to grab the throne. Your peers understand only force, and your subjects understand only gold. Gather your men, pay your knights, and assert your claim. Everyone will recognize the strongest and richest as the rightful monarch. In Melee you want to be the first person to capture an opposing castle (at which point the game ends immediately) or to have the most land and gold at the end of the year. Money is tight, and gold is used in the game both to build new units and to attack. The more gold you have and spend on your troops, the more motivated they will be and the higher your probability of success. Each player starts the game with a Castle, one unit of foot soldiers, and 15 gold coins. The game begins with a drafting session in which you purchase units (soldiers, knights, camps and catapults) and bid on special abilities that will enhance your income, attack, or other options in the game. The game is then played over four turns (seasons), and in each turn players simultaneously choose one of three potential actions: (a) tax, (b) build new units, or (c) move and attack. Each turn ends with players collecting income. To attack, you move your unit into an occupied area, then secretly decide how much gold you will spend to motivate your troops. The defender then has to guess how much you have spent. If the defender guesses wrong, the attack succeeds; if the defender is correct, the attack fails and you lose your unit. Regardless of success you have spent your gold, so the tight trade-off that players have to assess is whether to be cheap with your men so that you can conserve gold for future builds and attacks, or be generous to increase your chances now but limit future options. The different abilities available in each game make for varied strategies and strong replayability as no two games are alike. After the initial strategic planning stage, Melee is fast and highly interactive. Beware as the game can end suddenly with a bold attack on an inadequately defended castle, making for a game that can be very nasty, brutish and short. 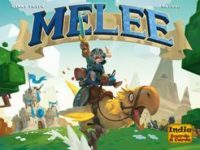 Add a Review for "Melee"